Lyme disease, named for a town in Connecticut where it was first properly discovered in the mid-1970s, is easier to spot and more dangerous in humans than it is in dogs. Lyme disease in dogs is far less common, but it can be a problem, particularly in areas with high tick concentrations. In America, problem areas for Lyme disease include New England, the upper Midwest and the West Coast. Let’s look at Lyme disease in dogs, how it spreads and how to best prevent it! 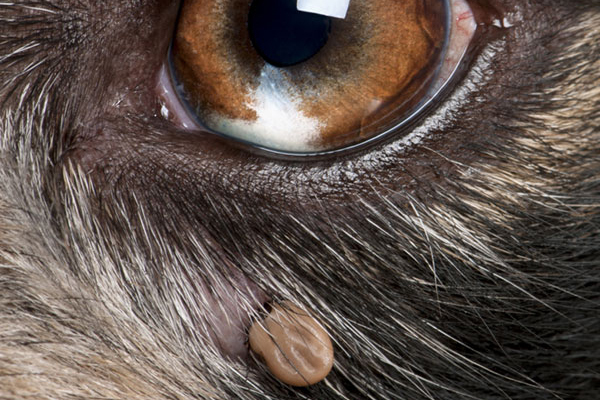 Close up of a tick near a dog’s eye. Photography by Eric Isselee / Shutterstock. Lyme disease in dogs is associated with deer ticks, but ticks are only a delivery system for the bacteria that actually causes the disease. The white-footed mouse carries a corkscrew-shaped bacterium, called Borellia burgdorferi. In the larval and nymph stages of a deer tick’s life cycle, baby ticks ingest Borellia as they feed on infected mice. The bacteria mature in a deer tick’s gut until the tick reaches adulthood. The fully grown deer tick, seeking a more satisfying meal, is the most common transmitter of Borellia bacteria, which causes Lyme disease in dogs. An infected adult tick needs time to pass Borellia into its canine host. Typically, a tick must be attached to a dog for no less than 12 hours, and usually between 24 to 48 hours, before the bacteria makes its way through the tick’s saliva into a dog’s bloodstream. From infection to the onset of symptoms, Lyme disease in dogs can take anywhere from two to five months to develop. When they do show up, signs of Lyme disease in dogs may include a number of symptoms held in common with other diseases and disorders, so proper diagnosis is key. The symptoms of Lyme disease in dogs include pain and swelling in the joints. Seemingly out of nowhere, you may see a dog start to move gingerly; over the course of several days, this arthritic pain may shift from one leg to another. Though the lameness may appear sudden, remember that Lyme disease in dogs takes several months to develop. Other signs of Lyme disease in dogs include increased heat and sensitivity in the affected joints, fever, diminished appetite and depression. In the United States, Lyme disease in dogs is uncommon outside of the Northeast, Midwest and West Coast, particularly the Pacific Northwest, so dogs with these symptoms elsewhere may have other problems altogether. Fortunately, Lyme disease in dogs tends to resolve much more easily, and with far less deleterious effects, than in humans. In many cases, the Borellia burgdorferi bacterium that causes Lyme disease in dogs presents a self-limiting problem. This means that the symptoms noted above may only be temporary as the bacterial infection runs its course. Treatment depends on an accurate diagnosis, which can be provided by a veterinarian. Antibiotics are extremely effective, when recommended, in resolving cases of Lyme disease in dogs. Vaccination against the Borellia burgdorferi bacteria is also safe and available, though it is normally only recommended in those regions where the disease is most prevalent, and even there, vaccination must be administered annually, if the veterinarian determines it to be prudent. Lyme disease in dogs is much less common than it is in humans, so prevention is the best thing you can do, both for yourself and for your dogs. How do we go about preventing those little corkscrew bacteria from making homes in ourselves and our dogs? If you live in one of those regions where Lyme disease is endemic, or where ticks are common, make sure to check yourself and your dog on a regular basis. Deer ticks are active during all times of year, needing only temperatures above freezing to be out in search of a blood meal. From spring to fall, when ticks are out in force, make certain you are using all appropriate tick prevention techniques, from medicated collars to regular baths, to keep your dog tick free. Finding a tick on your dog, refrain from touching it with your own flesh, especially if you happen to have any open wounds or sores. Use tweezers to remove the entire tick, and, if they’re available, do so while wearing gloves. Guinea fowl have a taste for tick meat, and find them delicious. Of course, lovely birds though they are, and interesting to look at, keeping a brood of guinea fowl on hand to prevent Lyme disease in dogs is completely impractical. Careful grooming, particularly in high-tick areas, and especially before you bring a dog indoors during warmer months, is both much simpler and more cost effective than taking up guinea fowl husbandry. The bottom line: ticks are disgusting! Thankfully, Lyme disease is not zoonotic. Neither you nor the members of your household can contract Lyme disease from an infected dog; only from the bite of a tick. Accordingly, I never walk my dog in the forest trails around our home unless I’m kitted out in full battle regalia. Long-sleeved sweaters and socks hiked up to my knees draw curious responses from people during the summer, but I am ever on my guard against the iniquitous deeds of parasitic arthropods. Tell us: Has your dog ever dealt with Lyme disease? Did it prove to be self-limiting and go away on its own? Has your dog been treated with antibiotics, or do you vaccinate your dog annually? Share your experiences with Lyme disease in dogs, or just let us know how much you loathe ticks in the comments! The post Lyme Disease in Dogs: Causes, Symptoms and Treatment appeared first on Dogster.